The organ of St John's is an extremely versatile instrument and can be used either to accompany choirs and/or orchestras, or as a solo instrument in its own right. It had it's most recent renovations in 2014, having previously done in 2004. It has however had a varied history since its first installation in the late 1700s, and like all large church organs, continues to be an ongoing project. The first organ was installed in the church was built by George England around the end of the 18th century. It was placed in the west gallery in a position not uncommon of most churches in mainland Europe. It comprised two manuals only. In 1835, it was rebuilt by Hamilton and a third manual was added, followed by a pedal organ in 1852. 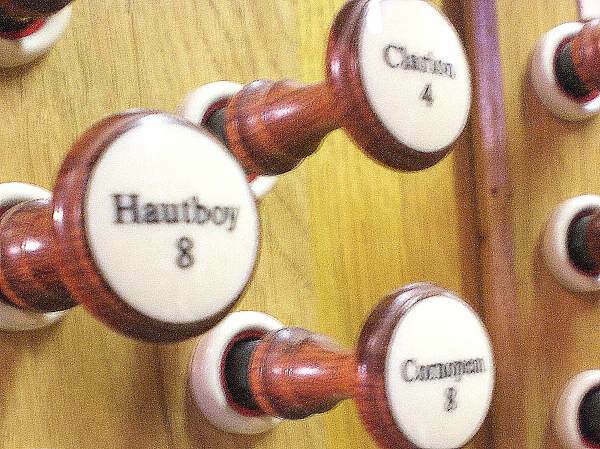 Eleven years later, the organ builders Holt of Leeds totally rebuilt the instrument to comprise 3 manuals and pedals with a total of 32 stops. In 1880 the organ was moved to its present situation on the North side of the chancel; arguably a decision which was to cause many of the problems encountered over the next century. In 1900, the famous English organ builder Father Willis was invited to produce a totally new intrument. He was asked to use as much of the original George England pipework as possible, since it was a far superior quality to anything that had been added later. Despite complaining bitterly about the lack of space in its new position(! ), Father Willis was able to produce a sizeable three-manual organ. In 1930, another rebuild was undertaken by Rushworth and Dreaper, which involved tonal modifications and the insertion of a 4th manual, in preperation for a new Solo division which was be installed opposite the console on the South side of the chancel. Over the next 20 years, attempts were made to install the new division, but these never came to fruition, the main reason being the expense of changes to the structure of the church. No work was done on the organ for 40 years. By 1973 it was starting to show its age and it was accepted that it needed much work. It was decided to rennovate the organ completely while the church was being rewired and decorated. The ailing pneumatic action was replaced by modern solid state electronics. This cleared much needed space at ground level behind the console, which was also remodelled and renewed. Again, the opportunity was taken to alter much of the pipework tonally. R. Goldsmith of Edinburgh was given the task of rennovating the organ. He left the swell and great divisions for the most part as they were. He added some extra ranks, removed duplications, undertook revoicing and removed the Solo manual. His most dramatic alteration was the in the Choir division, which at the time was thought to be ineffective in the overall balance of the organ. He removed the front of the swell box and added various new ranks to produce what is predominantly a Positif organ. In 2003, the organ was rebuilt by Geoffrey Coffin from Principal Pipe Organs of York and rededicated on 11 January 2004. All the out of character pipework was removed, a new console was installed and the bellows and the action was replaced. Provision has been made for a number of new stops that will complement the existing tonal scheme.